The Scrub-Aire 2000 is easy to use, easy to clean, and provides air scrubbing duties within or close-by a work area. The Scrub-Aire draws contaminated or polluted air through pre-filters located on each face which remove the larger airborne particles, before drawing air down through an integral High Efficiency Particle Attenuation (HEPA) filter to remove the very fine particles. The HEPA filter will separate out more than 99.995% of particulates down 0.3 micron size, before discharging air at low level. Where the problem is an "odour" a supplementary carbon filter is available (on request). The Scrub-Aire is on castors and is designed to be a "roll-up, plug-in, switch-on" product - positioned where convenient to the user; it is quiet to operate, and has variable flow control. It is constructed principally of ABS and consequently is easy to clean, making it a good option for hospitals, clean rooms, and computer rooms - although it will work just as effectively in a workshop environment ! Click here for more information on the Scrub-Aire. You can either collect hire equipment from our depots or we can deliver to your location anywhere in the UK. 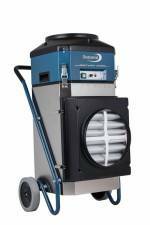 An air scrubbing unit ideal for capture of medium through to very fine airborne dust particles, the Aircube 2000 equipment employs a HEPA filter in conjunction with pre-filters to remove dust particles down to 0.3 micron diameter. Generally airborne particles of this size can penetrate deep into the lung tissue and are therefore considered potentially hazardous. ► freestanding as an air "scrubber", returning the cleaned air to the room. ► to create a negative-pressure enclosure. Negative pressure enclosures operate at a lower pressure than their surroundings, and clean air infiltrates into the enclosure; this helps ensure that airborne contaminants remain confined to one area. The extracted air is removed from the enclosure by the equipment and filtered to remove airborne particulates, before being discharged "clean" to the outside environment. The equipment is "roll-up, plug-in, and switch-on", with a variable fan speed so it can be adjusted to suit the size of your room. Its' low noise level and makes it a good option for use in shops, workshops, warehouses and even offices. Click here for more information on the DC 2000 Aircube. The DFU 600 is a portable, versatile dust-filtration unit equipped with a HEPA filter, capable of moving up to 600m3/hr (approx. 350 CFM) of air. 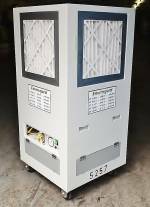 This small hand portable and very quiet unit can simply stand in a room and scrub the air, returning it back into the room after removing the airborne dust. Its low noise level and small size make it ideal for dust control applications in workshops, offices, commercial premises, computer rooms, hospital premises etc. 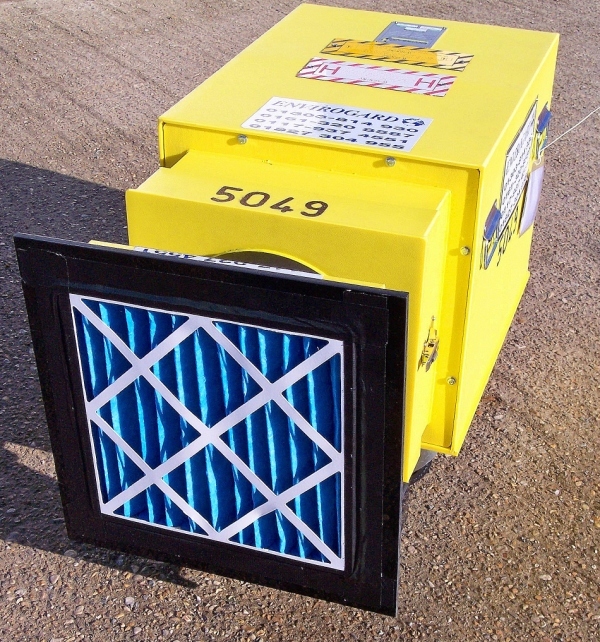 It can also be used with its roving hood to provide spot extraction, or you can connect a ducting to the discharge side of the unit if you want to ventilate filtered air into a confined space. Power connections 1 x 16amp, 110v. 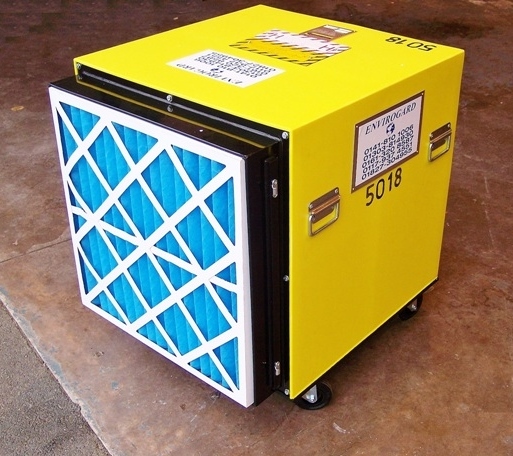 Click here for more information on DFU Air Scrubbers. The DFU 1800 is a medium size dust-filtration unit. It is fitted with variable flow-control which, together with the use of twin extract fans to achieve its throughput, makes this a very versatile and quiet running unit, ideal for noise sensitive area. This unit is therefore popular for applications in environments such has hospitals, occupied buildings, shops, and offices, and for jobs where the user wishes to vary air-flow during the course of the job. It is mounted on castors for manoeuvrability, but handles allow it to be carried where necessary. 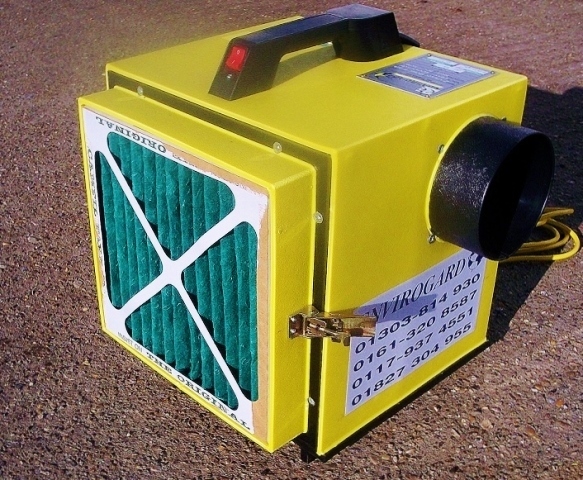 Equipped with a HEPA filter it is capable of moving up to 1800m3/hr (1050 CFM) of air. As with all other machines in this range it is equipped with a roving pre-filter hood which can reach some distance from the machine using flexible ducting. 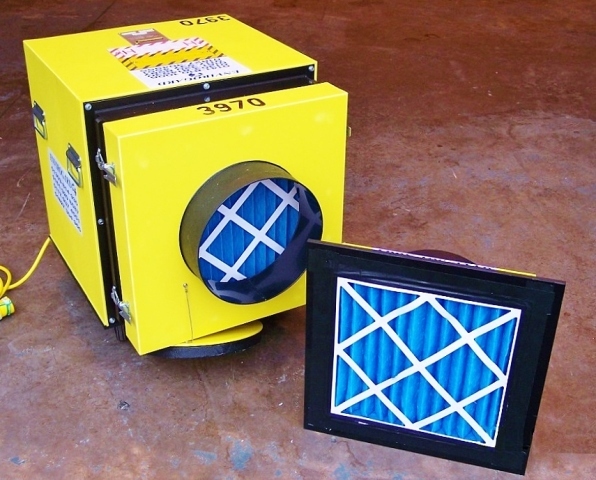 Click here for more information on our DFU Air Scrubbers. The DFU 2300 is a compact, medium size dust-filtration unit; mounted on castors it can easily be manoeuvred, and carry handles allow it to be readily handled where ground conditions are too rough. 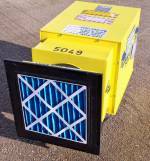 Equipped with a HEPA filter it is capable of moving up to 2300m3/hr (1350 CFM) of air. Although this is a higher air movement capacity than its sibling (E-VAC 1800) the E-VAC 2300 is an overall smaller and lighter machine; this is achieved through use of a single, high-speed, centrifugal fan. The machine is equipped for 3 -stage filtration (shown), and for applications involving high dust-loading it can be equipped with special pre-filtration options including bag filters (please enquire). This machine is particularly well suited for use on construction sites, factories, and in warehouse environments. Power connection 1 x 16amp, 110v. Click here for more information on our DFU Air Scrubber range. The DFU 5000 is a high capacity dust-filtration unit which is equipped with two independently switched motors, allowing the user to select full-capacity or half-capacity operation. Mounted on castors it can easily be manoeuvred, and carry handles allow it to be lifted over rough ground. It is capable of moving up to 5000m3/hr (3170 CFM) of air, and can sustain high levels of suction well over 750 Pa.
On request this machine can be equipped with a supplementary pre-filtration stage incorporating bag filters to remove coarse dust before it reaches the HEPA filter. This makes it a good option for applications involving high dust levels, combinations of fine and coarse dust, or for applications which require a large volume air movement. It's quite routine for a number of units to be deployed together to provide a bank of extraction. Power connections 2 x 16amp, 110v. Click Here to find our locations. We offer a delivery service throughout the U.K.; please enquire for prices, or collect for free from our hire depots. Please fill in the characters in the field below, you will then be able to submit the form.